Why choose the Scott & Sunny Townsend Team of Keller Williams Realty? Here's what some past clients have to say. Scott knows his business, customers, and territory extremely well and has the trend data to substantiate his position and recommendations both as a seller and a buyer, especially in the Higgins Beach area. He also put together an excellent marketing plan, presentation material and energy to ensure we achieved the greatest exposure which lead to a strong offer. 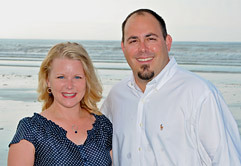 Scott and Sunny listed and sold our Higgins Beach property and that was a great experience. They were 'right on' in their analysis and the property sold quickly. They also provide rental services to another property we own and they, and their staff, continue to provide outstanding services to us. We're thoroughly satisfied. From the start, you listened to what we were hoping for. You found something that fit, got us the info we needed to negotiate a deal, and did it all in a friendly and efficient way. Now we have a dream come true. Thank you. Thank you so much for not only selling my condo at an excellent price in a buyer's market but finding the perfect house for Hamish and me. The extraordinary care and consideration extended me often made me feel like I was the only real estate client in the world! I'm certain all of your clients feel the same. The integrity, honesty, patience and sense of humor you each brought to what is supposed to be a stressful process made it a smooth and seamless one. Scott and Sunny were super. They listened carefully to what we were looking for and provided property recommendations that matched our interests perfectly. They provided excellent guidance throughout the process, responded promptly to our questions and requests, communicated thoroughly, and achieved a great outcome for us through what turned out to be somewhat complex and nuanced negotiation with the sellers. And they are lovely people besides! Scott and Sunny are an absolute pleasure to work with. We recommend them highly. Thank you so much for all of your great work in selling my condo, Scott & Sunny. I sure do appreciate all you did for me. You are hard and dedicated workers, not just when it is convenient for you, but all of the time. Scott & Sunny have been excellent to work with - an A+! They are doing a great job and are always accessible. We would highly recommend them. Debbie and I wanted to pass along our appreciation for your effort and good work that led to a successful sale. You presented a model for service when we initially met and you followed through on it completely. We have and will continue to pass along your names to friends and family in the Greater Scarborough area. Thank you, Scott, for helping make our dream a reality - now we own a great house at Higgins Beach! It's hard to imagine a more complex transaction: executing a 1031 transfer to sell two houses and purchase another, within just one month, all the while living 2 hours away!! Your energetic, proactive and professional approach, coupled with your comprehensive market knowledge and real estate expertise, helped make this complicated transaction as seamless and stress-free as possible. Your responsiveness to questions and advice regarding negotiations was invaluable. We couldn't have done it without you - thanks! Kathy and I are writing in order to express our sincere appreciation and satisfaction with our recent effort to acquire our dream cottage at Higgins Beach. As you well know, our purchase was the result of years of careful consideration. When you entered the equation you partnered with us and your professional approach coupled with a wonderful over-the-top personal service commitment made the difference. That was especially important as we addressed the challenges of being for out of state. You know the market and you took the time to know us. The result is self evident. If there is any opportunity to provide your potential clients with references, please do not hesitate to share our contact information. Scott was informed of my dream to live at Higgins Beach and he made it come true with professionalism and enthusiasm! I have since learned that these qualities are hallmarks of who Scott is as a person! Additionally, Scott's dynamic and intelligent wife Sunny has joined the team. Together they are a unique winning combination sure to give other "dreamers" the realization of their dreams! Thank you for your help and expertise in finding just the right home for Kathy and I! Your concern and commitment to all your clients was obvious and your positive attitude helped take the stress out of buying a new home! Where do we begin? A thousand thank-you's...for making this house our home. We truly believe that without your expertise, our relocation experience would have been quite different. Your professionalism and "know how" combined with a healthy dose of humor made our path to Maine a good one. We always knew that we could call on you with any concerns and you would address it immediately. Thanks again for everything! Thanks for making our home buying experience painless. You guys are the best!